(Nanowerk News) Cars that run on natural gas are touted as efficient and environmentally friendly, but getting enough gas onboard to make them practical is a hurdle. A new study led by researchers at Rice University promises to help. Rather than shoehorn bulky high-pressure tanks like those used in buses and trucks into light vehicles, the Department of Energy (DOE) encourages scientists to look at new materials that can store compressed natural gas (CNG) at low pressure and at room temperature. Cage-like synthetic macromolecules called metal organic frameworks (MOFs) are among the candidates. MOFs are nanoscale compounds of metal ions or clusters known as secondary building units (SBUs) and organic binding ligands, or linkers. These linkers hold the SBUs together in a spongy network that can capture and store methane molecules in a tank under pressure. As the pressure is relieved, the network releases the methane for use. Because there are tens of thousands of possible MOFs, it’s a daunting task to synthesize them for testing. Researchers have turned to using computers to model candidates with the right qualities. A team led by Rice bioengineer Michael Deem went a step further; they used a custom algorithm to not only quickly design new MOF configurations able to store compressed natural gas — aka methane — with a high “deliverable capacity,” but ones that can be reliably synthesized from commercial precursor molecules. And here’s a handy bonus: The algorithm also keeps track of the routes to synthesis. Deem and his colleagues at Rice, the Lawrence Berkeley National Laboratory and the University of California-Berkeley reported their results this month in the American Chemical Society’s Journal of Physical Chemistry C ("In Silico Discovery of High Deliverable Capacity Metal-Organic Frameworks"). MOFs show potential for applications like drug delivery, sensing, purification and catalysis, but methane storage for transportation is high on the DOE’s wish list, Deem said. “MOFs are being commercialized for methane storage in vehicles now,” he said. The advantages to using MOF as a storage medium are many and start with increased capacity over the heavy, high-pressure cylinders in current use. The Rice study found 48 MOFs that beat the best currently available, a compound called MOF-5, by as much as 8 percent. The program adhered to standard DOE conditions that an ideal MOF would store methane at 65 bar (atmospheric pressure at sea level is one bar) and release it at 5.8 bar, all at 298 kelvins (about 77 degrees Fahrenheit). That pressure is significantly less than standard CNG tanks, and the temperature is far higher than liquid natural gas tanks that must be cooled to minus 260 degrees F.
Lower pressures mean tanks can be lighter and made to fit cars better, Deem said. They may also offer the possibility that customers can tank up from household gas supply lines. 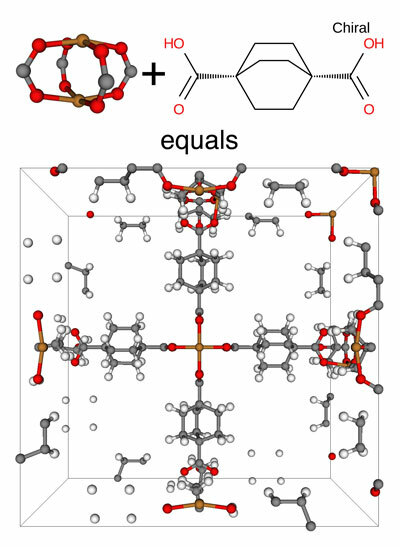 The Deem group’s algorithm was adapted from an earlier project to identify zeolites. The researchers ran Monte Carlo calculations on nearly 57,000 precursor molecules, modifying them with synthetic chemistry reactions via the computer to find which would make MOFs with the best deliverable capacity — the amount of fuel that can be practically stored and released for use. “Our work differs from previous efforts because we’re searching the space of possible MOF linkers specifically for this deliverable capacity,” Deem said.